Great small solar aeration systems for water gardens, small fish ponds or to have emergency back-up aeration in case the power goes off! Solar powered aeration systems are the ideal choice for remote ponds and lakes where power is not available, too expensive, or simply if you are in a windless area and have lots of sun; it is also an environmentally conscious solution. These are solar direct systems and have no batteries so they are providing aeration only when sunlight is hitting the panels. 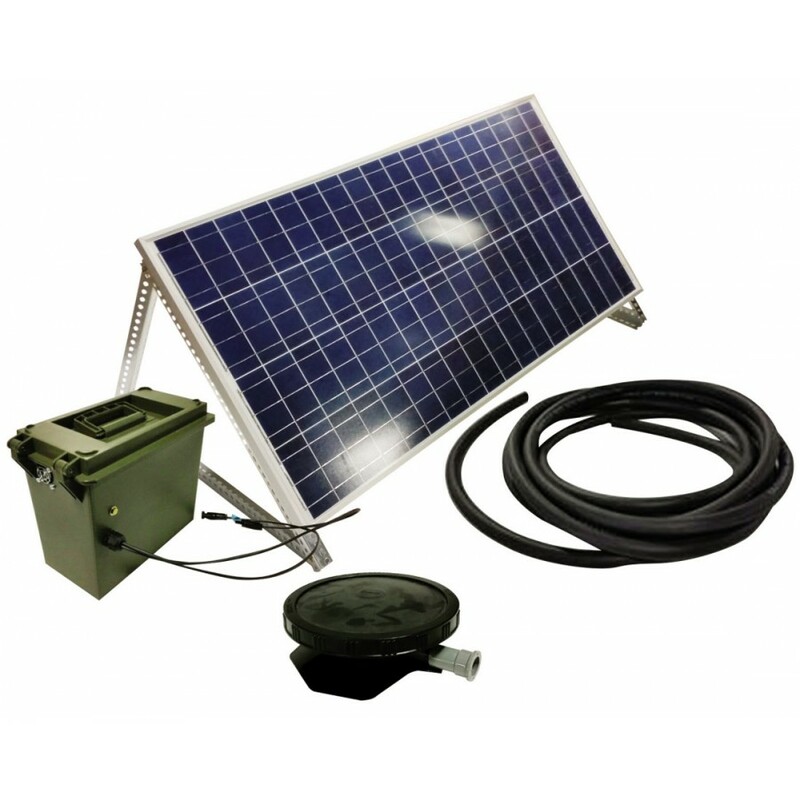 The Solar Direct DDKP1 Includes Solar Panel, Koi Pond Direct Drive Compressor, Cabinet with Fan, 25' of Weighted Airline and one Optimal Air Diffuser. The Solar Direct DDKP2 Includes Solar Panel, Koi Pond Direct Drive Compressor, Cabinet with Fan, 50' of Weighted Airline, a 2 Way Valve & two Optimal Air Diffusers. Energy Ecient – No Electricity Required! Battery Free Operation. We have eliminated the expense of rechargeable batteries and charge controllers by offering a direct drive (DD) aeration system, perfect for koi ponds. Each system includes 1 high efficiency solar panel, an aluminum mounting bracket with variable angle configuration, 1 DD compressor producing 2.0 CFM of air, a DD controller, enclosed lockable cabinet with weather seal, solar power disconnect and cooling fan. Solar powered aeration systems are the ideal choice for remote ponds and lakes where power is not available, too expensive, or simply if you are in a windless area and have lots of sun; it is also an environmentally conscious solution. Solar direct systems operate at maximum efficiency when sun is striking the solar panels. 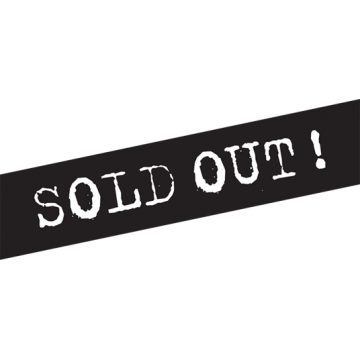 On cloudy days, even during daylight hours, the system will function but at a low capacity. Direct These systems are best used in sunny bright locations and in ponds with a maximum depth of 6 feet. Despite the limitations of solar direct systems which operate without batteries they offer excellent aeration and are better than having no system at all. 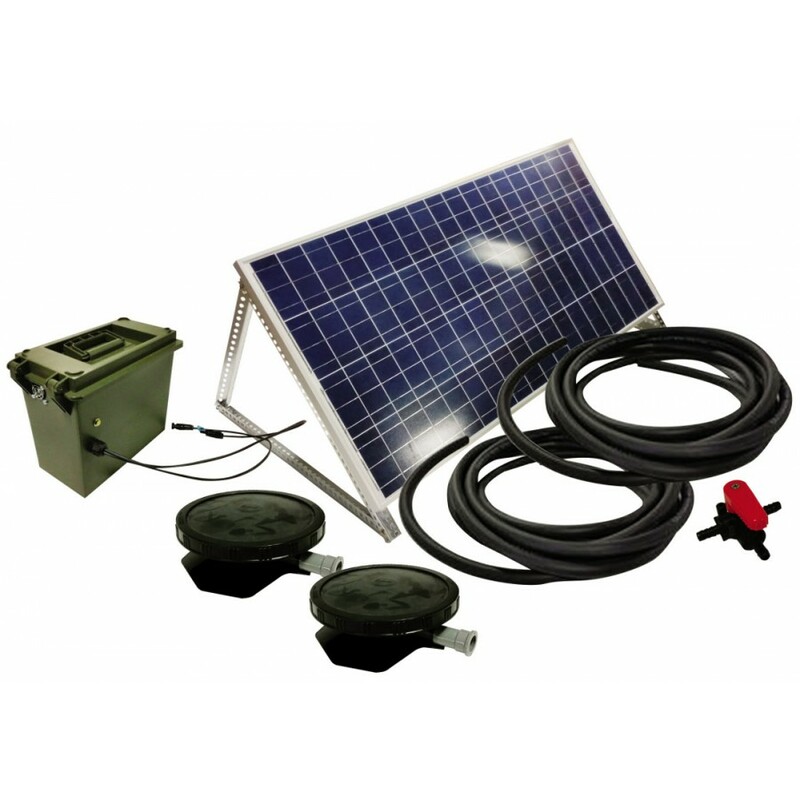 If you have no AC power available or want to add an aeration system that doesn't cost any money to operate then these small solar direct systems are a perfect choice and come as a complete plug-and-play package.